Finally, it is time to make this announcement! I've been working very hard these past couple of months to get everything ready for this and now it's only four weeks away! 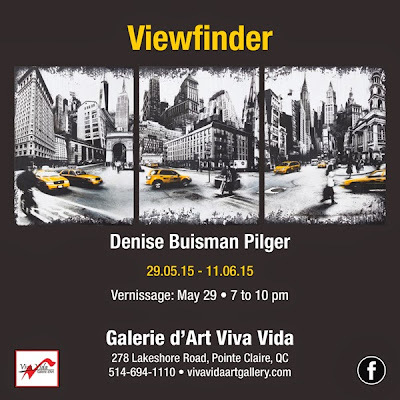 On May 29th we will be celebrating the opening of 'Viewfinder', my upcoming solo exhibition at Viva Vida Art Gallery. The exhibition will run from May 29 until June 11 at Viva Vida Art Gallery in Pointe Claire village and you are all invited to the vernissage which will be held on May 29th from 7-10pm. This exhibition will feature a series of new works including a Big 48"x108" triptych of New York! You will be able to do a bit of traveling to exotic destinations as Paris and Italy, and experience the beauty of everyday urban treasures! So market your calendars for a chance to look through my 'Viewfinder' on May 29th from 7-10pm at Viva Vida Art Gallery in Pointe Claire.